In a culture that's stuck in a revolving door of political scandal, Social Media trends, and attempting to keep up with the Kardashians, it has become very difficult for the human conscience to have a voice in our lives. Whether we are looking at our tablets, cell phones, or televisions, we are constantly bombarded with so much noise. With so many other voices guiding our responses to what we see or read in the media, how do we decide the proper way to respond to any given issue? Well the Socially Just artist known as Nomis believes we should stand first on the principle of "Loving your neighbor as yourself". 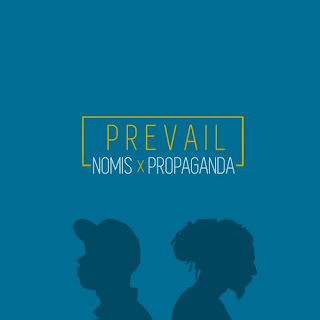 When Nomis pulled the trigger to write a song such as this, he enlisted longtime friend and fellow Social Justice advocate, Propaganda (Humble Beast). The two met back in 2005 and over the years have had many collaborations amongst colleagues that left them just two degrees of separation away from each other. Realizing that they had never directly worked on any music together before, this seemed like the topic to debut on. "Prevail" begins with the clicking of sticks together followed by a single chord piano strike. Once the rapping begins, the minimalistic sticks and piano strikes are forced to make room for the early 70's esque drum break that is both busy and dirty. After a melodic female vocal that controls the chorus, the music begins to change as Propaganda begins to speak. Before you know it, you are listening to a completely different time signature than the one the song began in. The two rappers are now trading off moments of spoken word poetry over a swinging acoustic guitar riff. Soon after the listener is settled in the new time signature, the music transitions back to its original format and the rapping continues. The word, "bold" can be used to describe both the songs format, and the songs content.